June 18, 2012, 5:03 p.m. This is as “Hot Off the Presses” as it gets! I just finished watching a live podcast of PC World’s coverage of Microsoft’s LA introduction of the “Surface” tablet. Yes, this is Microsoft’s own hardware. And does it ever look snazzy! And practical. Would it be a Windows RT tablet, with an ARM processor running tablet apps only — a direct competitor to iPad and other tablets? 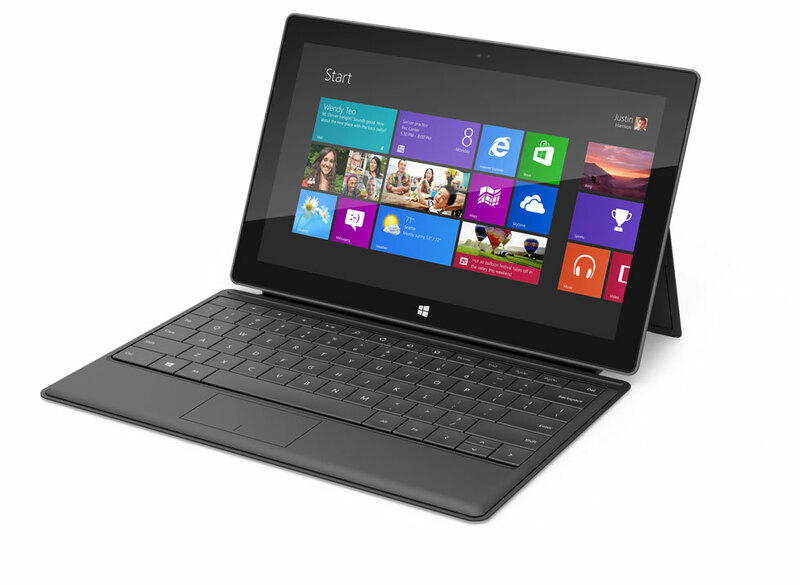 Would it be a full Windows 8 tablet, running full desktop programs — a PC in a tablet form factor? Turns out it’s BOTH. Surface comes in two flavors, Windows RT and Windows 8 Pro. Both have a 10.6 inch display. The RT version comes with either 32 GB or 64 GB memory; Windows 8 Pro version comes with 64 GB or 128 GB. You can use it as a touch-screen tablet; stand it up on its own kick stand for viewing movies, etc; and the screen cover can be folded down in front of the free-standing tablet and serve as a keyboard. Price? That’s still a mystery. It was said that the RT version would be inline with other tablets, but that’s a big window: from $200 to $700. The price of the Pro version was not addressed. Hopefully we’ll hear about that soon. When will we see these tablets? The RT version will come out simultaneously with the release of Windows 8, presumably October. The Pro version will appear 3 months later… looks like an end of year introduction. In my June TTT article I said I’d be waiting to see these Windows 8 tablets before I brought out my credit card. I think I’ve just seen my tablet. This month, I’m going to introduce you to a new class of laptop computer. Then I’ll compare and contrast these new laptops to the upcoming Windows 8 tablets. As you’ll see, the line between the laptop and the tablet is blurring. Does this foretell the death of the laptop? The dawning of tablets that are “real” computers that are able to run “real” computer programs (as opposed to primarily content consumption devices) has advanced well beyond the rumor stage. They are real, and they are coming this fall. The details of who is going to offer what is still rumor. There have been substantial and credible leaks, but for the most part, companies are remaining mum on details. One of the more exciting rumors is about the HP “Slate 8.” This is supposed to have a state-of-the-art Intel processor running Windows 8 Professional. This means that you will be able to truly install and run desktop software, as well as Windows 8 apps, on the device. The Slate 8 is believed to have a 10.1-inch display, is 0.36 inches thin, and has a 10 hour battery life. Dell is also expected to enter the fray with its own Windows 8 tablet. Recently leaked specs on the first Dell offering rumor that it will also have a 10.1-inch display and a similar thickness (or “thinness”) as the HP Slate 8, an Intel Clover Trail Atom dual-core processor (Intel’s low power-consumption processor due out soon), 2 GB of RAM and a 128 GB solid state drive. The HP and the Dell are just the first two of what promises to be a whole slew of Windows 8 tablet options that we will undoubtedly see this fall. Many of these will probably be variations on the versatile tablet-laptop hybrid design, which gives the user the option of using as a stand-alone tablet or docking a keyboard to the device. This fall is guaranteed to be an exciting time in this new tablet computing market. I’ve got a couple of things for you today, including great news about high speed Internet in SaddleBrooke. I’ll also have something to say about those tablet thingies (technical word) you see all over the place. Remember, you can read all current and past Two’s News articles right here on this Website by clicking “Two’s News Articles” at the top of the page. You can also select “Timely Updates” under the topics heading to read about things that come up between articles. Regardless of what they are calling it, it does have some upgrades. The most obvious one is a higher resolution screen, a so-called “retina” display. I’m sure it will be an eye-popper. Rumor has it that the ubiquitous Kindle will soon have a color screen. I’m not talking about the Kindle Fire tablet, which has been color since its introduction. The rumor says that color is coming to the classical E-ink Kindle display. The advantage of the E-ink display is that it can be read outside in the bright sun. The Fire and other color tablet displays are too reflective to be easily seen in a bright environment. The rumor has it that the new color Kindle will be introduced in March, so we won’t have to wait too long to find out if it’s true.